Miss Print: Sew, Mama, Sew Giveaway Day! Hi everybody! If you're stopping by Miss Print for the first time from Sew, Mama, Sew - welcome! If you've been around these parts for awhile - you know I love you! Feel free to snuggle down, put your feet up, and stay awhile. I bet you'd like to know what I'm giving away right? How does some Heather Ross sound? I'm giving away four prints from Heather Ross' West Hill collection (which is out of print). 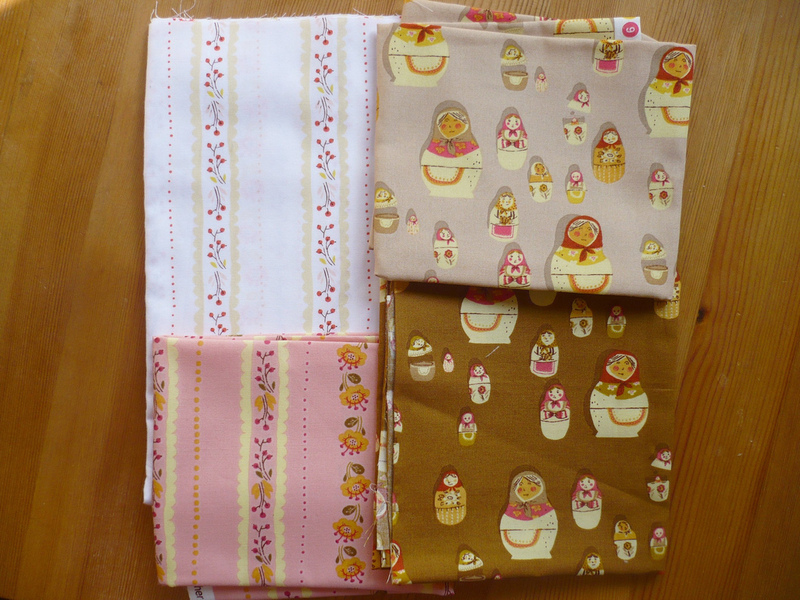 Up for grabs is a fat quarter of tan matryoshka, a fat quarter of brown matryoshka, a fat quarter of the pink floral stripe, and a fat quarter of the cream floral stripe (this is the one with the yellow leaves, not the purple). favourite winter treat is - hot chocolate? holiday cookies? something else? a second comment and you will be entered a second time. The first entry is mandatory to be entered in the giveaway, but the second is optional and you only have to leave a second comment if you are a follower and want a second entry. This giveaway (as always) is open internationally. I will pick the winner on December 16th and announce it here on the blog by the 18th. There are many more giveaways to enter over at Sew, Mama, Sew so make sure to pop by over there and check them all out! Thanks for stopping by everyone, and please keep in mind that comments are moderated - I will publish them as soon as I see them, but duplicate comments will be deleted. Good luck everyone and I hope you're having a wonderful day! favorite holiday treat is hard candy and ribbon candy. My favorite winter treat (which wouldn't necessarily need to be just a winter treat, but it's the only time I make it) is Chex Party Mix. Thanks for the chance to win! I am also a follower of your blog. Thanks again! I am a real sucker for holiday coookies! my poor waistline! my favourite winter treat is the "death by mint chocolate deliciousness' dessert that i make for my family. it's such a hit. love the fabrics! Nice giveaway Kaye! :) My favorite winter treat is definitely homemade cookies! My favorite winter treat is this cookie that an ex-co-worker would make every year. I don't even know what they're called but she makes them in this press and they're really delicate and have an intricate design on them like lace. They have a small hint of licorice taste to them, which surprises me that they're my favorite because I HATE licorice! Well, I would definitely choose cookies to be my favorite holiday treat. Specifically, I tried a new recipe this month for Brown Sugar Cookies from Cook's Illustrated. They were incredible! I got to say coffee, its the warmth on a cold morning that get me every time. Hot apple cider with cinnamon sticks! I love those peanut butter cookies with chocolate kisses in the middle! My favorite holiday treet is peanut butter fudge, soooo good! My favorite Christmas treat (aside from cookies) is pepermint tea. Yum! My favorite winter treat is hot chocolate. holiday cookies are a favorite - and blueberry candy canes! Favorite winter treat would definitely be the gingerbread cookies we make after we have made our gingerbread houses for the year. We dont have winter in Singapore. But I always love Christmas honey baked ham! heheh well it's not winter here so it's hard to think. But I really love chocolate self saucing pudding with vanilla icecream. Very decadent & warming! What a great giveaway! My favorite winter treat would have to be homemade fudge!! Yum!! I started following your blog! My favorite winter treat is a good pot of chili with poblano chilis and sour cream! Thank you for a great giveaway. Christmas cookies are definitely my favorite holiday treat! Thanks for the giveaway! Christmas cookies - especially iced gingersnaps! My favourite Winter treat is hot chocolate. Whenever I go to a cafe, when everyone else has coffee, I have hot chocolate, Winter or Summer. I'm now following your blog and look forward to looking through all your tutorials. I used to say chocolate chip cookies, but this year I discovered a recipe for cake batter sandwich cookies and they are AMAZING! I also love dark chocolate hot chocolate with mini marshmallows. My fave winter treat is holiday drinks! Like hot buttered rum and eggnog! Thanks for the chance! My favorite treat is all the special baking - especially if it involves chocolate! mmmmmm eggnog with spiced run and gingerbread!! Cute stripey HR! My favorite treat starts around Thanksgiving--anything pumpkin-y. I also subscribed to your blog as it looks like a fun read! Gingerbread men! Love that matryoshka fabric! hmm. pierogi! (we always have them on christmas eve)... but hot cider is a close second! I love Hot chocolate and pumpkin cakes traditional here in Portugal! I just became a follower. Thank you! Normally, I wouldn't say I have a favorite holiday treat, but my husband was gifted homemade almond toffee this year and I am making myself ILL eating the stuff. SO delicious. My favourite winter treats are homemade cookies. Thanks for the chance to win! I'm a follower. Thanks for the chance! ... and I follow your blog for some months now! I could eat it all day, every day. I've just discovered "Drinking chocolate" which is such a difference than american hot chocolate! We've purchased a little bit extra for when the family comes so they can try too! Gotta love both cookies and hot chocolate! But if I had to choose one, it would be the cookies!! My favorite holiday treat is peppermint mocha! MmMMMm. I love these fabrics and I'm really excited to have the chance at them! I know exactly what I'd make with them! <3 Thank you for a great giveaway opportunity, and many of life's blessings for you this holiday season!! anything with chocolate and mint! Love love love sugar cookies and fudge! I love sugarplum bread this time of year and hope to make some this week! Such sweet prints! Thank you for this giveaway opportunity!! My favorite holiday treat is hot spiced apple cider - YUM! egg nog, egg nog and more egg nog! 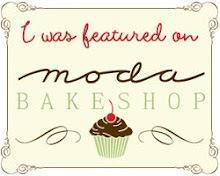 favorite holiday treat...hands down are cupcakes from the specialty baker! I've been a follower for awhile now- sweet giveaway! Great giveaway! My favorite treat is tamales. I know they aren't "sweet" but I look forward to them every year! I love mince pies - best eaten warm with a dollop of cream!! Hot Chocolate is my favorite holiday treat! I look forward to it all year. I am now a follower of your blog via google! My favorite winter treat is molasses cookies! I only have them this time of year and they are so good! I love hot chocolate and my mother-in-law's cookies. Favorite holiday treat ? Definitely chocolate. I could eat some all day, everyday ! My fav winter treat is my mom's homemade chex mix! YUM-O!!! My favorite winter treat is soup. Any kind of soup. I love having a nice warm bowl, of hearty comforting soup, when it's snowing and miserable outside. I love Quality Street Chocolates at Christmas! Oh that fabric is beautiful! Thanks for the chance! Fudge, or truffles. Or carmels... or hot chocolate.. Can I have more than one fav? Thanks for the chance! I love peanut butter fudge and reindeer chow for Christmas. My favorite winter treat is a warm cup of tea with a cinnamon stick in it. I love the way it smells! hmmm, homemade spicy molasses cookies for sure! Long time follower of yours here! My fave winter treat is a smorgasbord plate of holiday chocolates, cookies and chocolate covered rasberries with a cold glass of milk. i love all the holiday cookies, any kind will do! thanks for the giveaway! Favorite holiday treat, anything with peppermint in it!! I follow your blog via google reader....does that count? If not, feel free to delete this comment, I won't be offended! I enjoy eating dutch Taai-taai and chocolate letters!! I love Peppermint Mocha drinks at Starbucks! =) That's my fav! Oooh, excellent giveaway! My favorite winter treat is hot chocolate and bourbon. YUM! I love hot apple cider around the holidays. Thanks for the chance to win. I'd love some Heather Ross in my stash. My favorite winter treat (and most of the rest of the year) is chai tea latte! Yum! I'm a long time follower! One of my favourite winter treats is French Onion Soup, and if I am allowed a dessert then chocolate sauce pudding with custard. I love any and all homemade cookie, candy and cakes! I just started reading your blog. I check it first thing every morning. Love everything you do! My favourite holiday treat id white chocolate peppermint bark. Mmmmmmm I wish I had some now!! Fudge. With nuts, without, warm out of the pot or in large chunks sneaked when the kids aren't looking. And I love nesting dolls. Thanks for the giveaway! Gingerbread. I've been lusting after it all week since I had a tiny piece on Fri. Although I'm a serious chocolate fiend, my favorite treat around this time of year is Christmas pudding, especially for breakfast!! Favorite holiday treat, hands down, is eggnog with shot of The Kraken (spiced rum) in it. So yummy at the end of the day! Thanks for the giveaway. That fabric is so darling. I love my Aunt's fudge! I'm a follower!! Thanks for the giveaway! definitely hot chocolate, not too sweet... yum! and I'm a new follower! My favorite holiday treat is Little Debbie Christmas Trees! my favorite treat is gingerbread and baci chocolates. Homemade gingerbread --it makes the house smell so nice and it tastes good, too! Favorite holiday treat: Chex Mix and home made caramels (not together, but tied in my affection). I've just become a follower! My favorit treat is carret cake with cream cheess frosting. I have been a follower for a month or so now. really enjoy your blog. My favorite treat is our family's fudge receipe... yum! 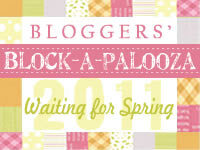 I have been a follower of your blog for a while now and I Love It! My favorite winter treat is called haystacks. My grandmother made them every Christmas by dipping a large marshmallow in melted caramel, then rolling it in rice krispies. My favorite holiday treat is peppermint hot chocolate. My favorite treat of the holidays is the cranberry cookies that my family has made since my mom was a child. They're so tasty! I'm a new follower. Thanks for the giveaway! I'm a follower on RSS feed! My favorite winter treat is soft peanut butter brittle! Yummm! I'm all about sugar cookies with icing and sprinkles. Nice giveaway! Oh dear, I don't think I can choose just the one winter treat that I like the most, I've so many and they're all delicious! :) But right now, I'm treating myself to some plum tarts and mulled wine to chase away the winter chill. THANK YOU FOR A SWEET GIVEAWAY! Sugar cookies that are shaped like ninjas with a chocolate milkshake. I don't have any cookie cutters but the ninjas and so it become a tradition. WE LOVE THE COOKIES+CANDY THAT GO WITH CHRISTMAS!I MAKE THE PLAIN SUGAR COOKIE RECIPE WITH 1 TSP. OF ALMOND EXTRACT+FROST+DECORATE. THE ENTIRE FAMILY/FRIEND GROUP WILL SOMETIMES GET INVOLVED! really good chocolate. I like homemade toffee too. :D Thanks for the giveaway! Hot cocoa! I drink it almost every chilly night. Thanks for the chance to win! Just found your blog today...I've got a lot of catching up to do!! I love baking and eating cookies during the winter. Oh my goodness, so hard to narrow it down. I love peppermint bark and hot chocolate! White chocolate drizzled popcorn with pepermint pieces! I love peppermint bark and hot chocolate. Some Holiday Stitching and a Winner!